The model is based on seven categories for planning and evaluating extension programs. The categories are linked in a logical “chain of events”. It starts with inputs and goes through to the last two categories of practice change and end results. The model has been tried and tested for over 40 years. With the emphasis being on practice change and end results for many extension program funders in Australia today; Bennett’s Hierarchy is still an extremely useful model for Extension Professionals to use. KASA, is a term familiar to many extension agents and is a key category in the hierarchy. It stands for changes in participant’s knowledge, attitudes, skills and aspirations. 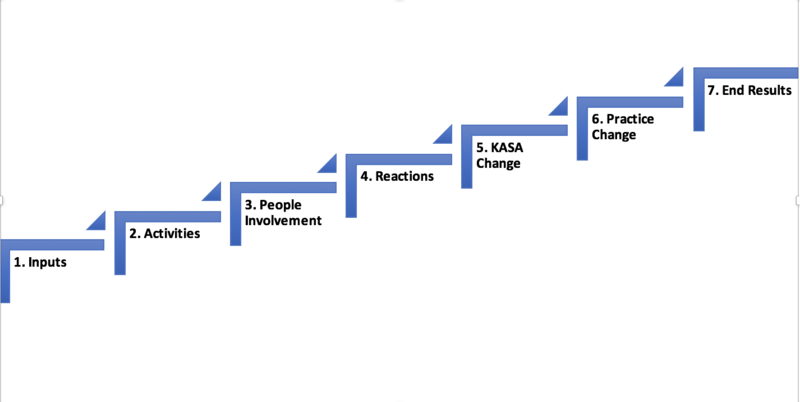 Bennett proposes that when participants apply their KASA, this leads to practice change and from practice change comes end results. Evidence of an extension program reaching it’s objectives can be gathered and mapped against Bennett’s Hierarchy. Bennett stated that: “Evidence of program impact becomes stronger as the hierarchy is ascended” (Bennett, 1975). Step 6. 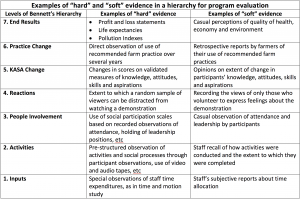 Select the levels of Bennett’s Hierarchy to be assessed and the quality of the evidence that is required: Document the information needs (evidence) for the evaluation for each level that is required to be covered in order to assess whether the program has met it’s objectives. 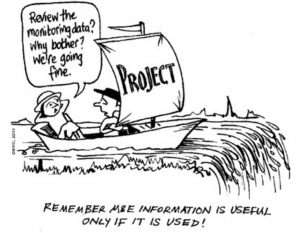 Quantitative (“hard”) data and Qualitative (“soft”) data will both be required. Evidence of “end results” is the strongest evidence for the extension program having met it’s objectives. Which levels of the hierarchy contain the kinds of evidence we need to make decisions? How “hard” does the evidence need to be? Are resources available to obtain the level and hardness of evidence needed?